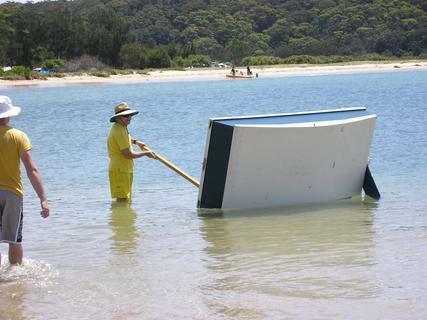 I guess like many I have toyed with the idea of building a boat for years, and finally decided to do something. I first came across Phil Bolger's name in the book "Cruising on a Small Income". 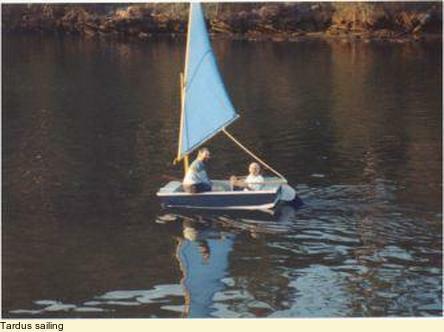 The author, Ann Hill, and her husband built a Tortoise as a tender for their 34 foot junk-rigged Badger dory. Lots of Internet hours later I knew a bit about Bolger's fascinating designs and got familiar with Dynamite Payson's web-site. 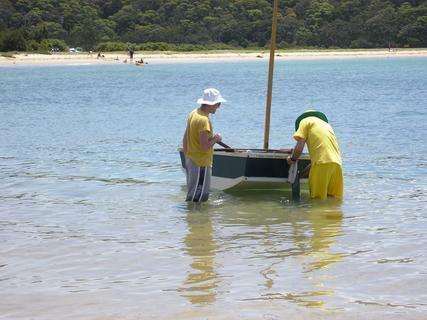 Mainly I made it 15% bigger all over, figuring it would then take 2 people sailing, if I could persuade anyone to come. and made buoyancy boxes at each end (that seemed a good idea - I've been reading Jim Michalak's articles, and the safety-first approach suits me well). scaled up the plan in Dynamite's book by 15%, making it 2200 mm (7' 4") long x 1100 mm (3' 8") beam x 470 mm (18") deep. For plywood I used cheap exterior 3-ply; marine-grade glue, but poor faces, and 7mm (just over 1/4") thick. Here in Australia (from Mister PlyWood) it is called CD grade, and cost me about $A30 per sheet (3 sheets). Marine ply is 2 to 3 times more costly. One face was better, so that went to the outside. It looked a bit wavy on the ground, but ended up looking straight in the boat. Glue - this is a cheap and cheerful project, so no epoxy. After some previous experiments I decided to try construction "liquid nails" type glue. Fuller's "MaxBond" was the choice. This is a thick, toothpaste consistency glue that comes in caulking gun cartridges (about $A3). It fills gaps wonderfully, and is very strong, and non-stringing. It is labeled as water-resistant only, but my test joint lay in the garden for months, and the joint remained strong. The glue worked, but is slow to cure, and sands poorly. I used it for all the main hull joints, but changed to a cross-linked aliphatic white glue (Selleys "Aquadhere - Tradesmens Choice") for the rest. Much easier to work with. I suspect this is the same stuff as the "Titebond II" I see mentioned in some US builders' web-pages. Fasteners - 22mm (7/8") x 1.6 mm (1/16") silicon bronze ring-nails - used these liberally to fasten the ply to the framing pieces. I also used some brass wood screws and some self-driving "treated-pine" decking screws in a few high stress areas. Framing - nearly all of it is 45 mm x 20mm (nominal 2" x 1") dressed radiata pine (cheap). The outside chines are a mixture of 90 x 20 and 70 x 20. I did this to avoid having to make the chines in 3 pieces as the plan has it. The acute angle cuts needed would have been tricky without a table saw. The penalty is weight, and a little more cost. 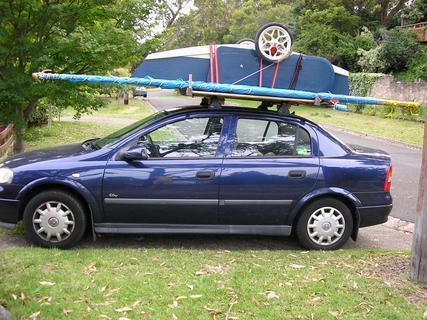 Sure looks sturdy though! Buoyancy chambers. I boxed in the small rear deck, and also the front angle of the bow with a deck about 300 mm (12") long and a vertical bulkhead. Here are some pictures of the second outing, at beautiful Bonnievale in the Royal National Park 30 minutes from my home. and sailing two-up at hull speed (maybe 3 knots).. 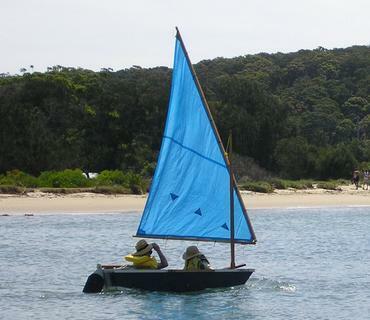 Here is the only time Tardus sailed at Port Stephens - a 1/10th scale model sailing on the end of a line at Taylors Beach. 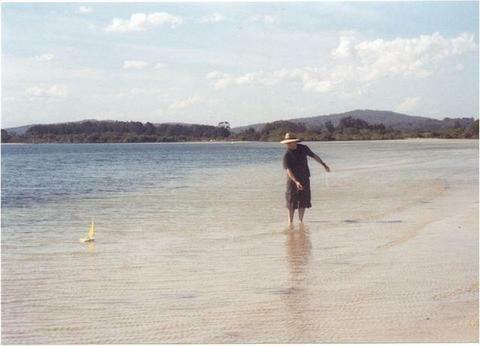 This was on the beach about 20 metres from the verandah of the holiday house we were renting.